Have you ever felt like you needed a little extra guidance or someone to coach you through a cleanse? Do you have specific health goals, or want to try something different? This is a new one-of-a-kind 5 OR 7-DAY customized cleanse that includes two 30-minute sessions with Owner Jamie Graber (valued at $250). Do a pre-cleanse consult to help determine your personal needs, how to cleanse properly, and then choose another mid or post-cleanse session to discuss your progress and how to ease off your cleanse. Consults are done via phone or Skype and must be scheduled at least 48 hours before cleanse start date. 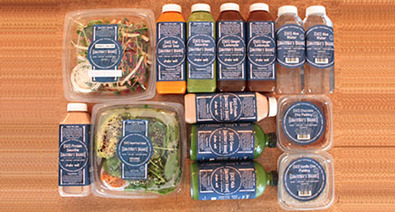 The 7-day cleanse includes 4 evening deliveries (5-9pm) and the 5-day includes 3 deliveries. In collaboration with bonberi we've developed a cleanse that focuses on optimal digestion and proper food combining along with plenty of greens (think juice & salad) to keep you nourished and satisfied all day long. Looking to drop a few pounds, but not give up chewing? Learn better habits while still getting that Glow with the [GO] CLEANSE. Inspired by Gabrielle Bernstein, this cleanse is perfect if you want to cleanse deeply but still chew. A mix of liquids and solids gives you the best of both worlds. [GO] Bro, inspired by Nico Tortorella- For those who want to cleanse and still [GO] hard at the gym.. Lets you drink and keep the fiber. If you want to do a deep cleanse, but want to keep things “moving”, then this is the cleanse for you. If you are trying to go a little deeper into a cleanse and let your body completely rest from digesting, then our [GO] LIQUID cleanse is the right choice for you. All the benefits of our original [GO] LIQUID cleanse without the sugar. Great if you are looking to take a break from sugar or establish new habits. Have you always wanted to do a cleanse, but your life got in the way? Our [GO] HAVE A LIFE Cleanse makes it easy to cleanse during the day and then have a sensible dinner with friends so you can maintain your social life.